Hundreds of Northeastern University students crowded in front of Blackman Auditorium on October 4th, eagerly waiting to hear Whitney Port’s story straight from the mouth of Whitney Port herself. 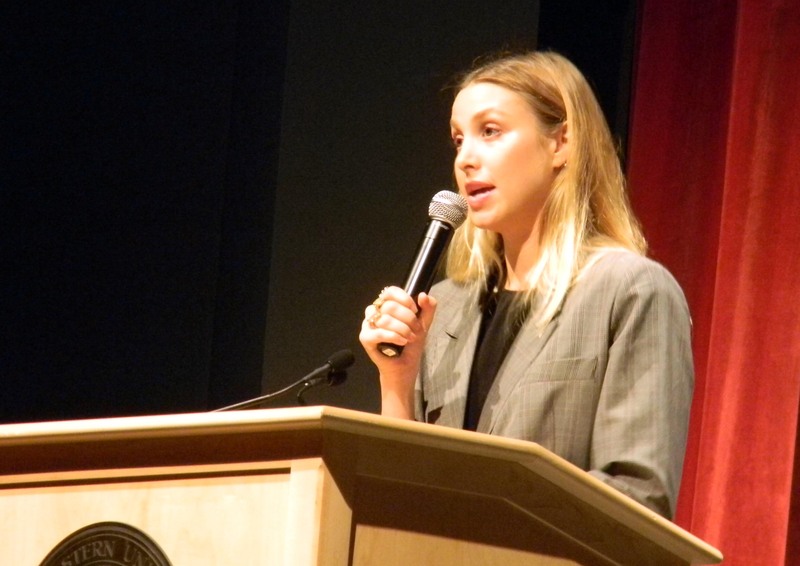 Sponsored by Delta Zeta and Council of University Programs (CUP), An Evening with Whitney Port welcomed The Hills and The City star to our Boston campus. She talked about going from a relatively fashion-centered family in Los Angeles to University of Colorado as a business major. Realizing math was not her forte, Port switched to become a fine arts major, only to realize maybe she wasn’t as good at art as she thought. “I needed a place to express my creativity and have a creative outlet,” said Port about her switch. Eventually, an even larger change was necessary. She moved back to sunny California to attend University of Southern California as a gender studies major although she always knew she was destined to be in fashion. Because of that drive, she took on internships while studying and that led to her spot on The Hills. Port admitted to hundreds of keen ears that she was never comfortable in front of a camera and had been close to turning down the Teen Vogue internship because of it. However, it was a once in a lifetime opportunity that she knew she couldn’t give up just because of some cameras. “You wanna be in the fashion industry, just do it,” said the designer. Despite interviews with MTV before her final interview with Teen Vogue, Port was never aware of what show she was being filmed for until Lauren Conrad also walked into the Condé Nast offices for an interview. She admitted that the producers were hoping the two would fight as they filmed episode after episode, but it just never happened. Port spent a large amount of time talking about her story and her internships along with her experiences in the industry. One of her main messages for the audience was to gain that experience now while in school, which was when she gave a shout out to Northeastern’s co-op program. “Good job on picking this school!” Port congratulated the audience before returning to her story about a transition from Teen Vogue to People’s Revolution, eventually leading to MTV following her to New York City to film The City. A private person, Port was hesitant about her own spinoff show, but eventually agreed because she knew she needed the exposure if she wanted her clothing line to succeed. A few daily struggles she has to battle with are the preconceived notions from The Hills, which includes people thinking that having a clothing line was never actually her dream. “This clothing line was always what I wanted to do,” shared Port who is still striving to prove herself as a designer in the concrete jungle. Port emphasized that education is important, but experience is critical as well. “Just as important and school and experience is giving back,” added Port, who then shared her testimony verbally and visually with a video about her experiences in Liberia with FACE Africa. All of this has led to what we see with Port now, which isn’t a reality television series, but a high-end fashion line called Whitney Eve. Similarly, Port recognized the power and importance of social media because even though she hasn’t done anything to be in the spotlight since the shows on MTV, she is able to keep in contact with fans. “It’s been a way to creatively show what I’ve been up to,” she said as she urged everyone to make a website or blog to showcase personalities. In addition to showing the fashion show for her Spring 2013 collection inspired by Crown Jewels she saw while living in London over the summer, Port answered audience questions on all subjects. After reiterating that nothing was off limits, she answered questions ranging from The Hills to career advice and from dating to what to do in Los Angeles. The audience walked out of Blackman Auditorium with a feeling of empowerment and motivation to pursue their dreams. “It’s the inner determination and at the end of the day, knowing what you’re doing is worthwhile,” said Port.